This post was sponsored by Johnson & Johnson Inc. There are a million ways in which you can enjoy the Summer. 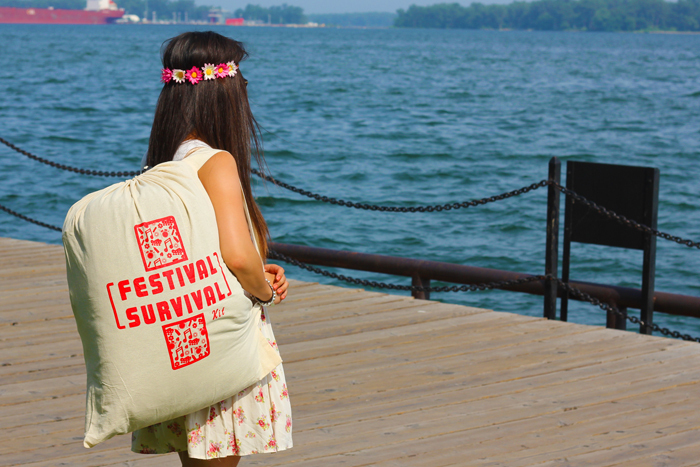 Whether you’re headed to an upcoming music festival, camping, cottaging or like us, hopping onto our sailboat for the day, staying clean, refreshed, and protected is just as important as having a load of fun. Oh, and just because you’re outdoors, doesn’t mean you ought to ‘rough it out’. 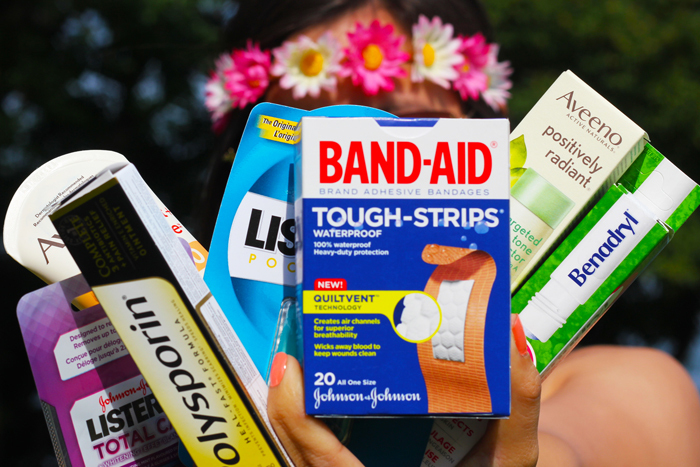 Here are some nifty products I’d recommend you to pack in your day/overnight bag: AVEENO Sunscreen to protect against sun’s harmful UV rays; BAND-AID Brand Bandage for unforeseen scrapes, blisters, and wounds; BENADRYL Itch Stick: I totally attract mosquitoes, and anti-itch stick is a must have in my bag; CLEAN & CLEAR Oil Absorbing Sheets: not only do these prevent breakouts by removing excess oil, but also keeps you selfie-ready! ; LISTERINE Pocket Paks: bad breath? No thanks! 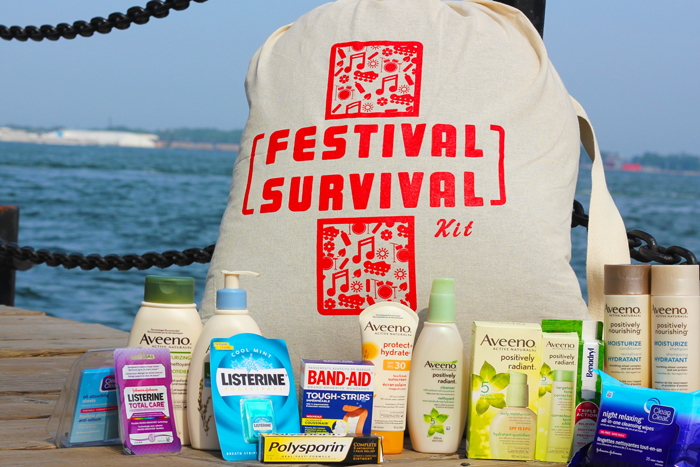 I’m stoked to team up with Johnson & Johnson Inc. to give one reader the chance to win an Ultimate Summer/Festival Survival Kit (approximately valued at $200) stuffed with products to help you survive the heat! Read further for contest details. Here is how you can win, enter the draw by using the WIDGET below. Contest is open from July 29, 2015 12:00 a.m. EST to August 5, 2015 12:00 a.m. EST. This contest is opened to Canadian residents, excluding Quebec. Must be 18 or older to enter. Winners will be chosen at random. The winner will be required to provide their contact information, sign a release, answer 3 questions related to Johnson & Johnson Inc. products, and answer a mathematical skill-testing question in order to receive their prize. +5 entries by commenting and sharing your what Summer events you’ve got planned! I am going to Lollapolooza in Berlin this summer! This festival kit would be perfect for it! We are going to a cottage in Quebec this weekend with our dog. I’m planning a fiesta for my birthday party at the end of the month. We enjoyed the Calgary Folk Music Festival, and my 6 year old daughter’s first concert – One Direction!!!!!! Wedding wedding weddings…. and maaybe a trip to montreal. I don’t have any events planned this summer except to take some local day trips. I went to a 5 Seconds of Summer concert. Taste of Italy & TIFF. Stag and Doe and my daughter is getting married! My biggest summer event is the Blues and Roots Festival. No big summer events this year really. My husband and I are going to go see Foo Fighters later this month, but just keeping things low key this year. Weddings, Weddings! Hope to go to the Squamish Music Fest. Nothing is confirmed yet, but I did get to Montreal. Love that city! no big summer events for me! Taste of Toronto, Beaches Jazz Festival, and the CNE. Our Chasing Summer electronic music festival starts this weekend here in Calgary! There was a huge festival in Craven. Just a couple of milestone birthdays coming up.